Introduction. Part 1 General issues: The friction stir welding process: An overview; Material deformation and joint formation in friction stir welding; Friction stir welding equipment; Industrial applications of friction stir welding; The future of friction stir welding; Inspection and quality control in friction stir welding. Part 2 Variables in friction stir welding: Residual stresses in friction stir welding; Effects and defects of friction stir welds; Modeling thermal properties in friction stir welding; Metallurgy and weld performance in friction stir welding. Friction stir welding (FSW) is a highly important and recently developed joining technology that produces a solid phase bond. It uses a rotating tool to generate frictional heat that causes material of the components to be welded to soften without reaching the melting point and allows the tool to move along the weld line. Plasticized material is transferred from the leading edge to trailing edge of the tool probe, leaving a solid phase bond between the two parts. Friction stir welding: from basics to applications reviews the fundamentals of the process and how it is used in industrial applications. Part one discusses general issues with chapters on topics such as basic process overview, material deformation and joint formation in friction stir welding, inspection and quality control and friction stir welding equipment requirements and machinery descriptions as well as industrial applications of friction stir welding. 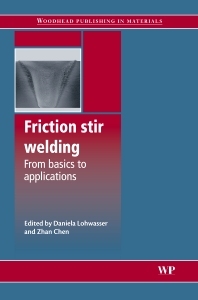 A chapter giving an outlook on the future of friction stir welding is included in Part one. Part two reviews the variables in friction stir welding including residual stresses in friction stir welding, effects and defects of friction stir welds, modelling thermal properties in friction stir welding and metallurgy and weld performance. With its distinguished editors and international team of contributors, Friction stir welding: from basics to applications is a standard reference for mechanical, welding and materials engineers in the aerospace, automotive, railway, shipbuilding, nuclear and other metal fabrication industries, particularly those that use aluminium alloys. Daniela Lohwasser is a friction stir welding specialist with AIRBUS, Germany. Zhan W. Chen is an Associate Professor in the School of Engineering at Auckland University of Technology, New Zealand.